There are many reasons you might need oral surgery, but wisdom tooth extraction is a common one. The idea can be unsettling for anyone. For the patient who has dental anxiety, it is even worse. Dr. Pita Dhaliwal and Dr. Kevin O’Shea offer comforting options in sedation for oral surgery performed at their Vernon office. Why worry about wisdom teeth? Third molars usually emerge at age 17 to 21 – presumably when we are a bit more mature and wiser. Historically, this extra set of grinding teeth was necessary for a largely raw diet. Modern man does not need them, and, in fact, they can cause dental and health problems. It is normal to feel some discomfort as these large teeth come in. However, if there is not enough space in the jaw, they can cause pain, swelling, and jaw stiffness. They may become impacted, meaning the crown of the tooth does not push through bone and gum tissue. Without adequate space, wisdom teeth can attempt to come in laterally, or push healthy teeth out of the way. That results in crooked teeth with areas that trap food debris and are difficult to clean with brushing and flossing. Bacteria flourish in these crevices, contributing to tooth decay and gum disease. Impacted wisdom teeth are also prone to develop cysts, which can damage roots and support structures of adjacent teeth. In any of these situations, extraction may be in your best interest. The dentist may also recommend wisdom tooth removal in preparation for orthodontic treatment. The dentist listens carefully to your concerns, examines your mouth, and takes x-rays. Together, you determine if extraction is the course of treatment right for you. An appointment day and time is established. The front desk staff talks with you about insurance or payment options. You need someone to drive you to the dental office and home afterward on the day of your procedure. Injections of local anesthetic ensure that the extraction site is thoroughly numbed. If the tooth is impacted, a small incision is made in gum tissue to allow access. A bit of bone covering the tooth may also be removed. A large tooth may be cut into smaller portions for easier extraction and reduced tissue trauma. 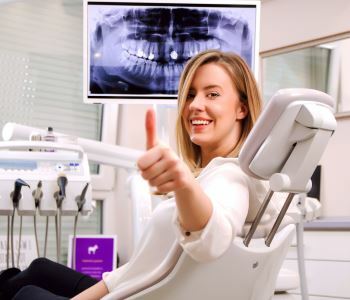 You feel no pain, just some pressure as the tooth is gently rocked loose from connective ligaments and lifted from the socket. How long you are in the chair depends on the length of time needed to get you numbed, how many teeth are being extracted, and the complexity of each one. 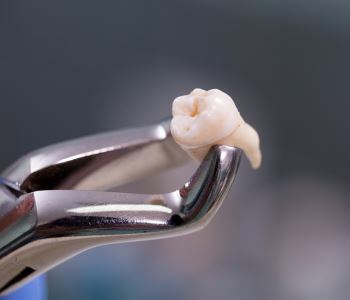 Removal of a large tooth with curved roots may take 20 to 30 minutes, while simple extractions take only a few minutes. The dentist may close the site with dissolving sutures. These stiches help to speed healing of soft tissues, keep the socket clean, and avoid dry socket. You are given thorough aftercare instructions, so you know just what to do when you return home. The Aberdeen Dental Centre team is just a phone call away if you have concerns. Usually only over-the-counter analgesics are needed to manage post-procedure discomfort. Most patients can go back to work the next day, and gradually return to normal eating within a few days. Now that you understand how extractions are performed, perhaps you feel more at ease. If not, Dr. Dhaliwal and Dr. O’Shea can help. They offer oral surgery with sedation. Nitrous oxide is an inhaled gas, administered just before numbing begins. It immediately induces a sense of relaxation, and the effect wears off quickly after the flow of gas is halted. Nitrous oxide is an excellent choice for the patient who has a fear of needles, and it is safe for children. Anxious adults may benefit from oral conscious sedation. This is simply a pill taken before the procedure. It relaxes the body as well as the mind, allowing the dentist to work efficiently, and promoting faster healing. 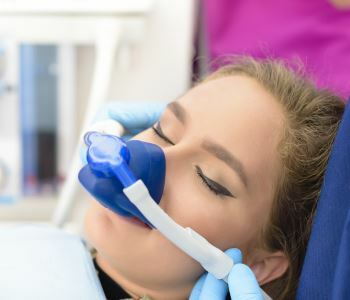 Nitrous oxide can be administered in combination with oral sedation. Please do not delay dealing with wisdom teeth due to dental phobia. Call Aberdeen Dental Centre in Vernon at (250) 800-2664 for oral surgery with sedation.